The Backlights for almost all LCD displays, including the iPad Air 2, have White LEDs, which are made by using a Blue LED together with a Yellow phosphor to transform some of the light for the Red and Green primaries, resulting in broad rolling spectra for these LCDs. However, Wide Color Gamut LCDs like the iPad Pro 9.7 instead use specially tuned Red and Green phosphors to optimally transform the light for the chosen saturated Red and Green primaries. The spectrum of an LCD display is just the spectrum of its Backlight filtered through the individual Red, Green and Blue sub-pixel filters within the LCD panel. 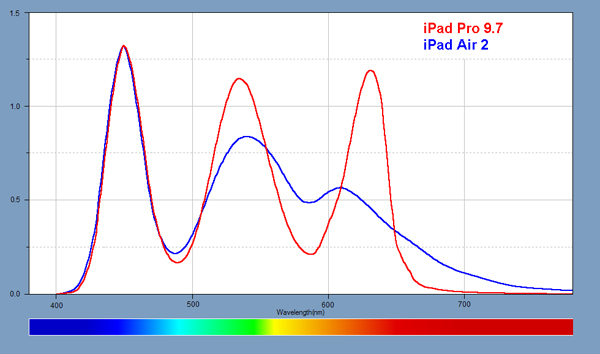 The iPad Pro 9.7 has much sharper Primary Color Spectra than the iPad Air 2 because its native Color Gamut DCI-P3 is much wider and more saturated than the native sRGB / Rec.709 of the iPad Air 2.